Barry-Roubaix Bicycle Race & After Party | Founders Brewing Co.
Posted on January 15, 2013 by Founders Brewing Co.
We are going to partner with Kisscross Events once again to host the annual Barry-Roubaix bicycle race, an event pitting thousands of bikers against gravel, rocks, sand and mud, and possible snow and ice in a kickoff to the racing season in Michigan. The fifth annual Barry-Roubaix, named after the classic Paris-Roubaix race in France, will begin and end in downtown Hastings, Mich., on March 23. 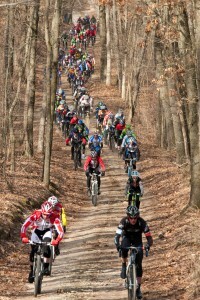 Registration is currently open at www.barry-roubaix.com. The popular event continues to grow each year, forcing a move this year from its former location at Gun Lake State Park to downtown Hastings. Last year nearly 1,600 cyclists participated. As title sponsor of the event, we are going to host a typical (killer) after party celebration kicking off at 11 a.m. with food, music, beer and more in the streets of downtown Hastings. The Founders Brewing Co. after party is open to racers, their friends, families and anyone else who would like to join in the celebration. Specialized Bikes, Freewheeler Bike Shop, Greenware and Delta Subaru are presenting sponsors of this year’s race. For more information, please visit www.barry-roubaix.com or contact Rick Plite, Race Director, at 616.863.3291 or rickplite [at] gmail [dot] com.